When there's two feet of snow in the yard, no fire in the woodstove, no electricity, a broken flashlight, and you've already read all the books in your room, you find yourself without much to do. With my laptop out of batteries I turned to my old friend iPod and cued up another podcast from The Dirtbag Diaries. For those of you not up on podcasts, they're like little radio programs you can download online and listen to while you commute to work, kill some time at the office, or while you shiver under the covers while listening to the cat chase mice in the attic. This podcast is produced by my friend Fitz Cahall, but even if it wasn't I would still be forcing it on all my friends and family. 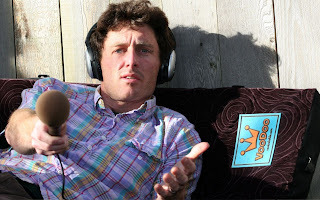 The podcast focusses on outdoor sports, travel, adventure, etc. There's stories about soldiers who put up a climbing wall in Iraq and another about setting fire to his dead car and pushing it into the Indian Ocean. The stories are funny, touching, though-provoking and above all they're entertaining. We could all use a little more of that in our life. So if you're a bored Peace Corps volunteer or someone who likes rock climbing or traveling then give him a listen. Check it out at http://www.dirtbagdiaries.com or download it for free from iTunes. nice photo...who is that yahoo.